An indispensable ally for every plumber, the Tesa hydraulic belt is a special type of professional adhesive tape specifically designed to carry out hydraulic repair work simply, safely and quickly. Tesa hydraulic belts are among the most reliable on the market: designed to perfectly resist water and seal pipes and fittings, they are available in two models. Tesa white teflon tape, not adhesive, is the best for hydraulic repairs: it resists lubricants and solvents, and can be used to hermetically seal leaking or plastic or metal pipe threads. Being a conformable belt, it adapts perfectly to every type of pipe and fitting, without deforming and without losing adhesion. The Tesa self-adhesive silicone tape is also adhesive-free, but it is fixed to perfection and creates a very tight permanent seal: it is very quick to use and seals at its best without having to wait for it to fix or dry. It resists water, oils, dirt, and can even be used for underwater applications: it leaves no residue when removed, which is why it is perfect even for temporary applications. The simplicity of use makes it also suitable for home repairs: waiting for the plumber to arrive, it is the top to temporarily stop a leak. All hydraulic belts in the Mister Worker™ catalog pass rigid quality tests to guarantee excellent performance in the field. 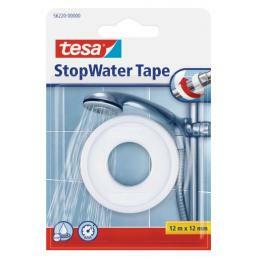 All hydraulic hose tapes are designed to withstand water and ensure every plumber can work in peace.